For over a decade, Google Adsense has been the only advertising network that pays good for Bloggers. But, in the recent years, we can find several new ad networks rising up like anything. Out of all, only a few succeeded and one among those is the Infolinks. Although, it’s not a complete replacement to Adsense, its way too better than the other Adsense alternatives out there. I’ve used it on several blogs of mine and the results were astonishing. The good part of Infolinks is that you can use it along with Google Adsense as they’re completely in-text ads. 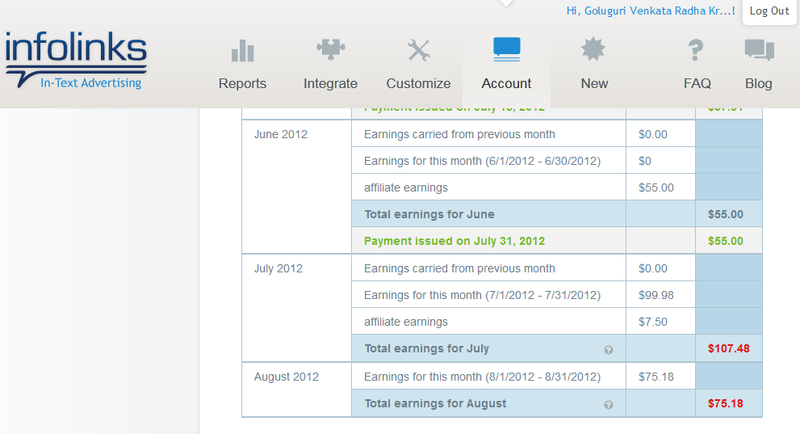 Besides Adsense, Infolinks is my next biggest contributor. I haven’t used it on 9to5Blogger yet, but have good experience using it on my technology blog and other entertainment blogs. Integrating Infolinks ads is pretty easy. Simply, go to Customize tab and customize the colors and max links allowed per page. Next, go to Integrate tab and choose the 1-Minute integration process. Myth Buster: There is no threat to your Adsense account if you use Infolinks along with it. Infolinks Payments: As of on writing this post, the minimum payout is $50 and PayPal is used as the default payment system. You can as well use various other payment options like Western Union, Bank wire transfer, Check etc…But, I personally prefer PayPal as its an easy way to receive money online. Infolinks Payment Cycle: Infolinks calculates your earnings at the end of each month for that month and issues your payment within 45 days of the end of the payment period, which is the standard industry practice. If you haven’t reached the minimum payment threshold ($50), then all those earnings will be forwarded to the next month and will be paid during the next payment cycle. 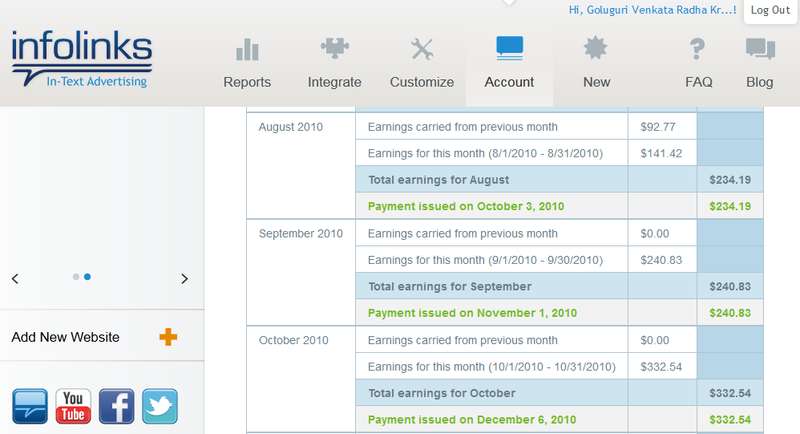 Here I am sharing my earning reports that prove the Infolinks performance. In my view, Infolinks is the best text links advertising program till date. I haven’t faced any problems with them till date except when I faced some problems with my PayPal account (which isn’t in their hands). Next Post:How to Transfer a Blog from Blogger to WordPress Easily? @Radhe bro does it pays PPC or Pay per Views ? Means $$$ For Ad Impressions ? Hi, this is Pamela from Infolinks. Thanks for sharing this great review with your readers. I’m really happy to hear how satisfied you are with Infolinks. Make sure to stay updated with our blog for the latest news and contests. how can you compare it with chitika? and does it harm seo or no of visitor?? There is no harm in using Infolinks w.r.t SEO and visitors. And when compared to chitika, i found Infolinks to be very effective in terms of earnings. my earnings from infolinks is not good.. some time eCPM is $5 and sometime it is only $0.2 .. i am new to blogging, my blog is only 2 months old .. so far i have made only $2..
Infolinks mostly works good when your traffic is decent and so pls try to increase your traffic by improving quality of your articles and promoting those on social networking sites. Dofollow blog commenting works gr8 to increase traffic to your site. Try it..
wow! today i found the alternative of adsense? tell me about more affiliates program. Very Informative post, I’ll try this one. Have you tried Chitika in-text ads. Infolinks is better for some reasons…..and also they are trusted.. Thanks for sharing. congr8 faraz..its good to know that you’re getting good CPC..
infolinks really pays.I like it due to its 6 ways of receiving payments.No other program has so many ways.